It's the little moments that crack me up. We went to the park today with my Aunt and 15 year old cousin, Brett. Brett skateboards. Hunter really really really wanted to take his trike in with the big kids instead of rolling around on the sidewalk outside and looking in wistfully. At the end I finally let him before we went home. I didn't want him in the big kids way the whole time. 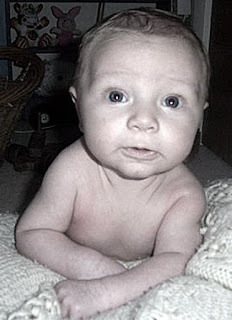 Look at him. He feels so big. 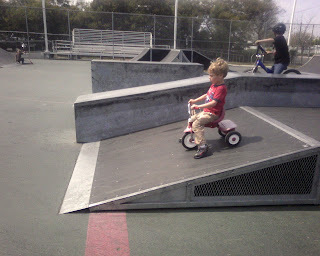 He kept dragging his trike up this ramp and rolling down. 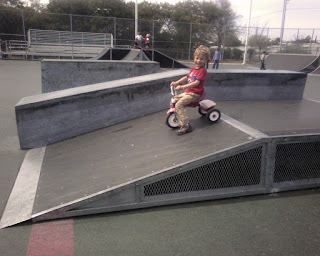 The bigger ramps were "too scary" he said. Sorry for the quality of these pictures. They were taken on my camera phone as I realized what a funny moment this was. And can there be anything more precious than bedtime? A lot of times, I don't want to do the whole routine, but when I do, it's always a sweet moment to end the day. Hunter has decided that he loves showers, because he doesn't like sharing a bath with sissy. She splashes too much. So she is brushing her teeth while she waits for Hunter to get out of the shower. It's more like she stripped her clothes off when she saw him get in and was shreaking to get in the bath too (she loves them). She kept yelling, "Ah Baff! Mommy. Tooooo!" Which means, "I want a bath, Mommy, too!" So to distract her while Hunter finished up, I let her "brush her teeth" after I was done brushing them. After the bath, she was busy reading the book I just read to Hunter while she was in the bath. And then both kiddos go to bed. Doesn't look like she is sleepy does it? She was not wanting to go. She was calling for Hunter who comes and gives her a kiss and a hug every night before she lays down. I made a video of it because it is so cute. But Hunter forgot so I had to go and get him. He was thrilled to be wanted, and came running. Wish I would have gotten the part of them kissing and hugging. Instead I just got the part of her calling to him in the doorway. Don't let her fool you. Rubbing the eyes is a dead giveaway. She's tired. It was long day! She says, "Where Hunter go?" And then she tells him "Night, night, Bye bye, and I love you". She cuddles into her "Nanny" (she has been calling her blanket this is for months for some unknown reason), puts her thumb in her mouth, and I don't hear a peep the rest of the night from her. She calls for me around 8am. And then I go to work. Except I was caught up tonight and didn't really do much. It was nice to just sit down and do other things besides working. A week later, I am still on Bangkok time and having trouble sleeping until 3 or 4 am. I just can't fall asleep. You would think I would have switched over by now. I am getting up in the morning so you would think the tiredness would catch up with me and I would sleep. Maybe tonight......I hope. We flew first class to Japan (12 hours), which was AMAZING! And then we flew business class to Bangkok (7 hours on which we slept the whole time). We got to our hotel, which was near the river, very late and slept. In the morning we got up, had breakfast in the lobby, and then took a boat down the river to the temple area and king's palace. We toured a huge Buddist temple (called a Wat) and the king's palace. Both of which we spectacular. Then we walked around, got a Thai massage, had some lunch/dinner, and went back for a nap. After that we went out to the market/tourist area for some nightlife. I don't think that city ever sleeps. It's busier at night believe it or not. In the morning, we had breakfast on the river, caught a flight to Southern Thailand, took a bus (2 hours) to the ferry, and then took the ferry (1.5 hours) to the island of Ko Samui. We checked into our place, and we were dying it was so extravagent and pristine, with over the top service. They looked surprised to see us, since we hopped off an opened back pickup from the ferry at their gate, with our backpacks. I am sure most people who stay here do not arrive like that. That night we had dinner with new Iranian friends we met on the ferry and rented motorbikes and rode around the island hanging out with them at some party places where we just observed the night life. In the morning, we had a buffet breakfast there, and settled out our bill. Come to find out, the pricing was a huge mistake on their part, but they honored it anyways. They were supposed to list it as US dollars, but instead listed it in Thai bat. A huge difference. It was supposed to be $400 a night for us not $15. We got this place on a total fluke. Amazing. But there we were. Tone got free windsailing lessons that morning for an hour from the resort, while I sat on the beach under palm trees. I could have rocked in a cushioned hammock if I had wanted.....that place is gorgeous and amazing. I only brought this backpack for two weeks. I travel light, no? We took our bikes out again to meet our new Iranian friends for lunch and another tour around the island. But it absolutely poured on us for about 3 hours non stop so we sat in the extravagant lobby chatting it up. A break in the weather made us antsy to get out so we jumped on the bikes and headed to a small fishing village Bo Phut for dinner...and it rained the whole way there (about 4 miles)...through 2 "rivers" running across the road up to our ankles...what fun that was!! An adventure to say the least! Had a nice dinner and walked through the local outdoor market. We chatted more with them that evening at their place before calling it a night around midnight. We woke up early, had a nice breakfast at a local German bakery then headed back to their place to see them off (they were headed to a smaller island to the north for the rest of the week where "LOST" was filmed). We planned to meet up with them in Bangkok the night before we left. That afternoon we headed to the southern town of Nathon to talk to the travel place about tours and eat. We found a place next to a waterfall to eat and then hiked about a mile through the jungle up to the base of a small waterfall. When you hike through the jungle, the air is constantly filled with buzzing, cawing, hooting, whirring, and clicking sounds. The air was alive and very loud. Especially the Cicidas which were like huge 2 inch crickets which constantly make a loud buzzing/whirring racket. We went to the beach that afternoon, went to the complimentary cocktail party and we chatted it up with an interesting German lady who offers Tibetian "healing" there at the resort. Hmmmm. We definately passed on that. We decided to take a tour. It was riding elephants, a little canoeing, a monkey/elephant/Thai boxing show, and another hike to a waterfall. I guess nobody really ever wants to hike to the top of that waterfall as it is a long, hard climb straight up through dense jungle. It was worth it though. Spectacular views and a lovely fall. It started to rain on us again as we went up, but it felt good because it was so hot and humid and we were drenched anyways. We were completely soaked. We came home, changed, ate a local Thai place (cheap and good and it became our favorite place to eat), and went out again to the tourist street until about midnight taking in sights. It was loud and crowded, but interesting. At this restaurant, we sampled Thai food like green, yellow, and red curry and coconut curry soup. Delicious! We found another German bakery and spent another hour chatting with the German lady who owned it. Loud and opinionated, she gave us a good inside view of the local area and culture. We hiked the beach again that morning, but as it was looking like rain again, we ended up holing up for a bit before we took our bikes out to do some shopping on the busy tourist street. Wednesday night the hotel gave us a private BBQ in front of our bungalow. So we dressed up, they had it decorated to the nines, and we had a VERY nice dinner where they fixed the food right next to us and served us with perfect service. 5 courses no less! Thursday, we went to the Anthong marine park, which is a group of small islands that are uninhabited. We took a ferry out to the islands and kyaked around one of them. The waves beat against the limestone rock sides creating an overhang and seacaves that we kyaked under. Very interesting, with the jungle going straight up the steep sides over our heads. We landed on a beach where we hiked into the island (more like straight up the sides on steep stairs) to see a salt water lake right in the middle, formed when some of those sea caves collapsed. We took the kyaks back to the boat to eat lunch while they took the boat around the island to another one on the other side. We again got off on a beach where you could snorkel or hike. Being the kind of adventurous people we are, we decided to do the 500 meter hike straight up the rocky sides to a point on the top where we could overlook the whole park and all the islands in it. Over an hour, but it was lovely and worth it. Again, we were soaked by the time we got to the top from the humidity. We could see Ko Tao, the island where Lost was filmed. Again, it was straight up through jungle, and the last part was a scramble up jagged rocks. Tone had an easier time than I did. I had to go slow because it was rough going. Back down on the beach, we swam a little before getting back on the ferry to go back. We went back to our favorite little Thai place to eat, and walked around the tourist street that last night on the island for souveniors and gifts. Since all of these islands were uninhabited, they were quite spectacluar to kyak around. The trail went through this cleft in the rock. Yes, I definately used the rope! A long hike, but worth the view! Look at all of those lovely island out there! Back on the ferry boat, Tone is pointing to the top of the hill that we climbed. We went on top of the rock up there. We flew back to Bangkok the next day. We went down the river to have dinner in a nice hotel overlooking the water. But we stayed too long and the ferry's weren't running anymore, so we had to take a tuktuk back. A motorized cart basically. The ride back was absolutely insane weaving through traffic and blowing through red lights. The next day (supposed to be our last in Bangkok) we took a tour up river to the old ruined city of the old capitol of Ayutaya. We saw the ruined palace and the beautiful summer palace which is near the ruined one. We also saw some more old Wats, and took the river boat back for a good view of the surrounding area and Bangkok. The served us lunch on the boat. We met up with our Iranian friends again and stayed up walking around the outdoor markets, eating a late dinner, and having another Thai massage (which is about $4). We got home at 2 am only to wake up at 5am to catch our flight out. On the two hour ferry ride back to Bangkok, this cracked me up. The houses looked like shanties, and many looked about to fall in as they hung precariously over the river, but almost every one had it's own satalite dish! You never know what you might find at the outdoor market! Eel for dinner anyone? No? Well, how about a Cicida, grasshopper, or magot? They're fried! Getting home was a disaster. We spent 4 hours trying to figure out how to get a flight out of Bangkok, and realized that there wasn't a flight we could catch in the next week because of the jet crash in Narita, Japan which had backed up all flights through Asia. The only way to do it was to fly the next day to Singapore, spend a night there, and then fly from Sinapore to Narita, Narita to San Francisco, San Francisco to Monterey, pick up the kids, and then drive to Fresno that night. It was three days of being in airports, and the last day, over 24 hours traveling. Talk about tired. We got home 2 days later than we had planned, and Tone had to take more vacation time that he really didn't have. Yuck! But at least we got home. At our hotel in Singapore. We walked around Singapore for quite a while before turning in for the night. It was very clean and beautiful. And it gave me another stamp in my passport book!